As per budget 2018, there is no change in Income Tax Slab and Rate. So, you must be thinking that nothing is changed as far as tax is a concern. However, your assumption is wrong. Finance Minister has introduced 10 new tax changes in budget 2018. Most of the changes are unfavorable and will impact on your personal finance badly. Let’s take a look at 5 New Tax Changes and its impact post Budget 2018. As of last year, we were paying 3% health and education cess on all taxable income. This cess is now enhanced to 4%. This change will increase your tax liability. If you are from 20% slab your tax liability will increase by Rs.1125. Similarly, if you are from tax slab of 30% your tax liability will go up by Rs.2625. You can refer to image given below for the calculation and impact. 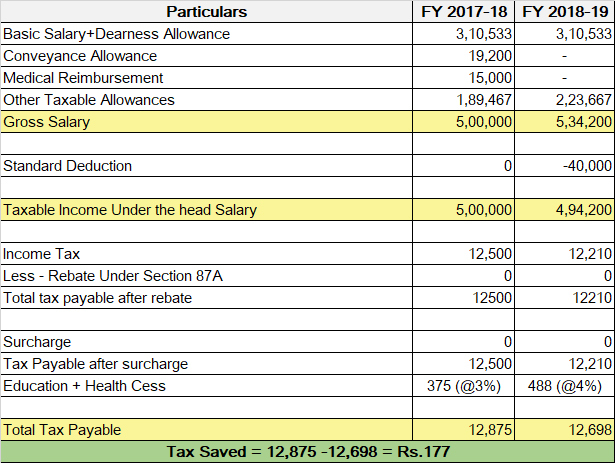 In the budget 2018, it is proposed to provide a standard deduction of Rs.40000 from salary income to employees. This means salaried people can enjoy tax-free income up to 2.9 Lakh. You might be thinking that Rs.40000 is a good amount and it will give a lot of tax saving. However, your assumption is wrong. Introduction of standard deduction will bring peanut type tax saving. If your taxable salary income is Rs.5 Lakh you will be able to save only Rs.117 via this standard deduction. For more information refer to the calculation given below. Another big tax change in the budget 2018 is removal of medical and transport allowance from the tax exemption. You may be aware that earlier salaried people were allowed to claim Rs.19200 towards transport and Rs.15000 towards medical reimbursement. So, total benefit amount was Rs.34200. In lieu of this amount, new standard deduction of Rs.40000 is introduced. 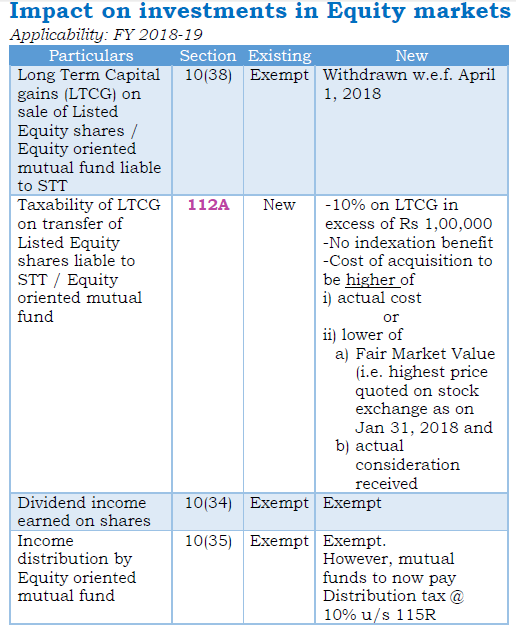 LTCG tax on the stock market and mutual fund investment in reintroduced in budget 2018. As per new rule any person who sells shares after April 1, 2018, will pay a long-term capital gains tax at the rate of 10 percent on gains of more than Rs 1 lakh. For such shares, the cost of acquisition will be price as on Jan. 31, 2018. No changes are made in short-term capital gain tax. Short-term capital gain would be taxed @15%. Let’s try to figure out how this change will impact you. 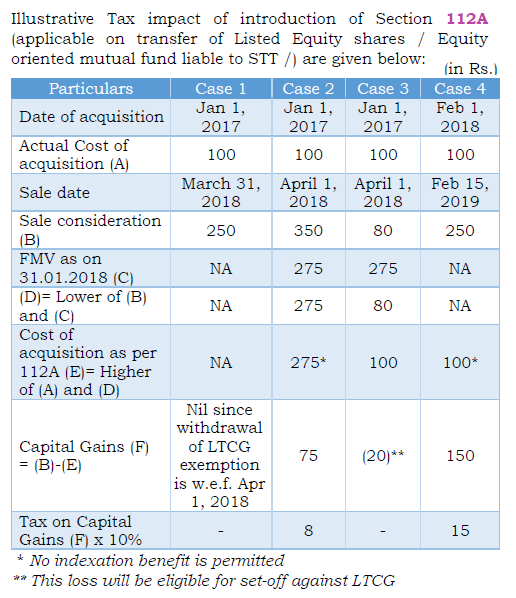 If you sell your equity or mutual fund investment before April,1,2018 you need not pay any LTCG as a new rule of LTCG will be applicable after April,1,2018. Suppose you sell shares after March,31,2018 you need to pay LTCG. LTCG is applicable beyond 1 Lakh. This means no tax is payable on profit amount up to 1 lakh per annum. Any amount beyond 1 Lakh will be taxed @10%. Suppose your long-term capital gain from equity and the stock market is 1.5 Lakh in a year. You need to pay tax on Rs.50000. How to calculate Long-term Capital gain tax on Stock Market? In order to calculate LTCG on stock market investment, you need to consider FMV (Fair Market Value). FMV for existing holding will be taken as on Jan,31,2018. FMV concept is a similar concept which is being used in ESOP for the tax calculation. If you have purchased a share of Rs.1000 and holding it since past 12 months or above FMV of these shares on Jan,31,2018 is Rs.1400. Suppose you sell it for Rs.1700 after April,1,2018. You need to consider Rs.1400 as a cost of acquisition for tax purpose. LTCG, in this case, would be calculated as follows. The escape route is either to sell equity and mutual fund investment before 31st March 2018 or accept and pay LTCG. New Dividend distribution tax is introduced on Equity based mutual funds. The rate of DDT would be 10%. DDT is applicable for all dividend mutual funds. DDT will be paid by mutual fund house and not by investors. However, it will impact adversely to the investor as the company will load this tax and pay less dividend to investors. I hope you have understood tax changes made by the government recently. Feel free to post your queries in the comment section. Can you just check the table given. Taxable income under head salaries is 5lakhs and not 50,000 In the table given.